This raw (unburnt) umber has a light green-brown color. It is suitable for making different green-brown tones. This umber is extracted in the regions of Italy, France, Germany and Cyprus. This pigment was already used in cave paintings in the Neolithic era. This umber is suitable for making different brown pigments. In addition to umber, ocher was also used in cave paintings since the Neolithic. Umber is darker than ocher and is characterized by its brown and red-brown shades. Historically it was widely used until and in classical antiquity. In the Middle Ages, until the 15th century, omber was used less often. The pigment was used for painting clothes, paintings and buildings. Each type of paint consists of a pigment and binder. To make historical pigment paint the pigments have to be ground. This is usually done on a flat piece of natural stone or a glass plate. The pigments are ground with a pestle or runner. How fine a pigment needs to be grinded depends on the type of pigment. The best way to learn this is by trying it out. Then you apply the binder. The binding agent affects the color and composition of the pigment. Below an overview of some popular paint types. Tempera paint was already used by the ancient Egyptians. Paint on tempera base remained by far the most frequently used paint technique until the 16th century. In tempera paint, the pigment is combined with a binder based on egg yellow, milk, honey, amber or gum arabic. Tempera paint is very long-lasting, even now there are classic examples left. Oil paint was used by Dutch and Flemish painters since the 2nd half of the 15th century. Oil paint was still experimental around this time, but revolutionary. Later it took over the entire position of tempera paint. In oils, the pigment is bound by linseed oil that can be cooked, uncooked or refined. The first dyed textile was found in Georgia and dates back to 34,000 BC. Textiles can easily be dyed with plant based paints or with other types of pigments such as madder, umber or ochre. The textile has to be dayed in a dye bath, with a kettle / cauldron hung over a fire. Tip: after the cauldron has been used to paint textiles, it can no longer be used for eating and cooking. It is therefore best to purchase a separate cauldron only for painting. Water-soluble top paint was already used in Classical Antiquity. Watercolor paint has even been found in old cave paintings, so watercolor paints, in combination with pigments such as ocher and omber, are the world's oldest paints. Watercolor paint is still used today. In watercolor paint the pigments are bound with water, gum arabic, glycerine, light honey, or ox gall. A seccos have already been made in the Mynozi culture in ancient Greece. From there, this technique spread to ancient Egypt. The Romans developed the making of a seccos into frescoes. In Roman cities such as Pompeii and Herculaneum it is clear how widely these techniques were used. This technique is still used today. The big difference between fresco and a secco is that fresco is applied on a wet surface and can only be used indoors. To create frescoes you need walls or ceilings that are free of moisture. You need: lime, coarse or fine sand, water, pigment. Gouache is an opaque paint on a watercolor base. The technique was already used in ancient Egypt. It was made by mixing lime, watercolor paint and gum arabic. In the Middle Ages it was difficult to get gum arabic, which is why a cheaper glue paint based on bone glue base was often used. Glue paint was already used in prehistoric times. To make glue paint, animal glue (skin glue, fish glue, bone glue) is soaked and dissolved in warm water (preferably by au bain marie). Then the adhesive is rubbed with pigment. This paint is not waterproof. 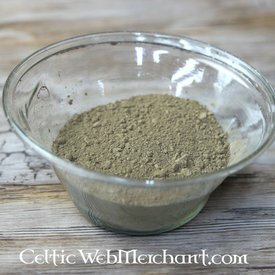 This pigment is only intended for making paint in a historical way. This allows different materials such as wood, plaster and textiles to be dyed. First test the paint on a small surface before use. Celtic WebMerchant is not liable for the obtained color results. This product is handmade on the Zaanse Schans in a traditional Dutch paint mill from 1782. This is the only remaining windmill in the world that still grinds pigments. In Holland, mills were traditionally used for grinding paint pigments. This item can’t be shipped outside Europe.